A common woodland tree throughout Europe, North Africa, and southwest Asia, elder was once regarded as a complete medicine chest: the root and bark made strong purgatives, while the leaves were made into a green ointment for use on bruises and sprains. Today, the flowers are most commonly used in refreshing elderflower cordials and medicinal brews. Elder flowers and berries are antiviral and immune stimulating. When taken hot, the tea of elder flowers or elder tincture in hot water will help sweat out a cold or fever. When taken cold, the tea is diuretic. Elder is most commonly used for treating upper respiratory infections, including the common cold and flu. The berries are quite high in health-promoting procyanudins. The purple, blue and black berries are best for direct consumption and for making syrup. The red berries are considered less choice. Make an infusion (p342) of 1 cup of boiling water over 2 tsp flowers. Drink 1 cup 3 times daily for feverish conditions and coughs; combine with yarrow, boneset, and peppermint in equal proportions for seasonal colds. Use 1 cup of a standard infusion of the flowers as a mouthwash and gargle for mouth ulcers, sore throats, or tonsillitis. Made from the flowers to soothe inflamed or chapped hands, or from the leaves for bruises, sprains, chilblains, or hemorrhoids. Add 1 pint (600ml) of a standard decoction of berries to 1lb (450g) honey and take in 2 tsp (10ml) doses for colds. 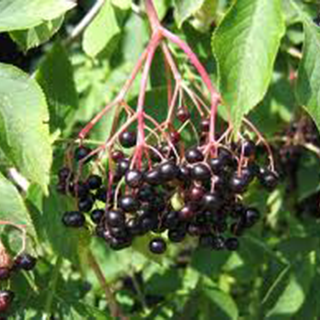 Take 2–4ml (40–80 drops) elderberry tincture three times a day for coughs, colds, and flu symptoms. Combines well with echinacea. The dried flowers are placed in a muslin bag and placed into a hot bath or face wash, used for improving the tone of the skin. To sweat out a fever a hot tea or tincture in hot water is sipped while one sits in the hot elder bath. Soak for 20 minutes, then wrap in a sheet and a blanket and go to bed. Pack the flowers in a jar and cover with simmering hot apple cider vinegar. Cover and set aside overnight then pour through a cheesecloth. This is a specific remedy for soar throat. Tolerates almost any soil, but prefers a moist, well-drained site. Propagate from hardwood cuttings in winter or ripe seeds sown in a cold frame; it will also self-seed easily. Can be invasive. Gather flowers in early summer and berries in early autumn, removing them from the stem before use.